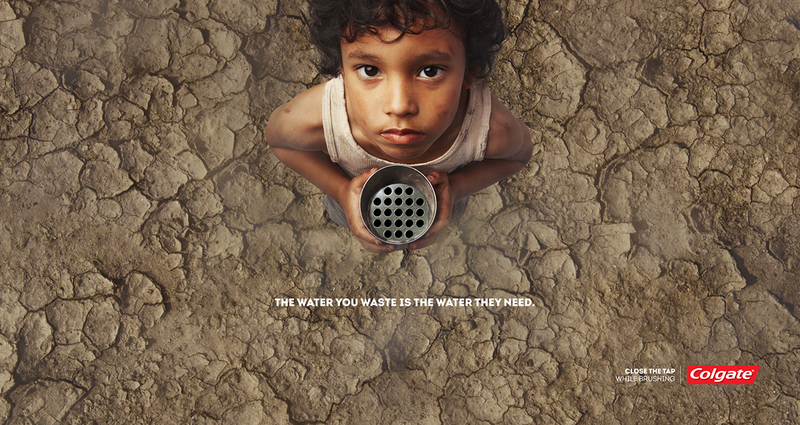 In an attempt to bring awareness to the water shortage reality that exists in Brazil, Colgate enlisted the help of Mauricio Candela & Marriott Hotels to launch the campaign, “Cada Gota Conta”. Colgate’s goal was to “enable guests to re-evaluate their water use habits”. They began the process by asking Mauricio to create a simple image of a child standing in a dry field with the message, “A água que você desperdiça é a água que eles precisam/The water that you waste is the water that they need.” The image & message was then printed and placed in sinks of the rooms and public areas in Marriotts across Sao Paolo & Recife. The placement was intended to capture the attention of guests while they were brushing their teeth and cause then to pay closer attention to their water consumption. Mauricio also created a short video that was launched on World Water Day (March 21st), which received 4.8 million impressions in the first 24 hours. More of Mauricio’s work can be viewed through his AtEdge portfolio and his website: mauriciocandela.com.